Tarek Yamani Trio Swings into City College Center for the Arts! 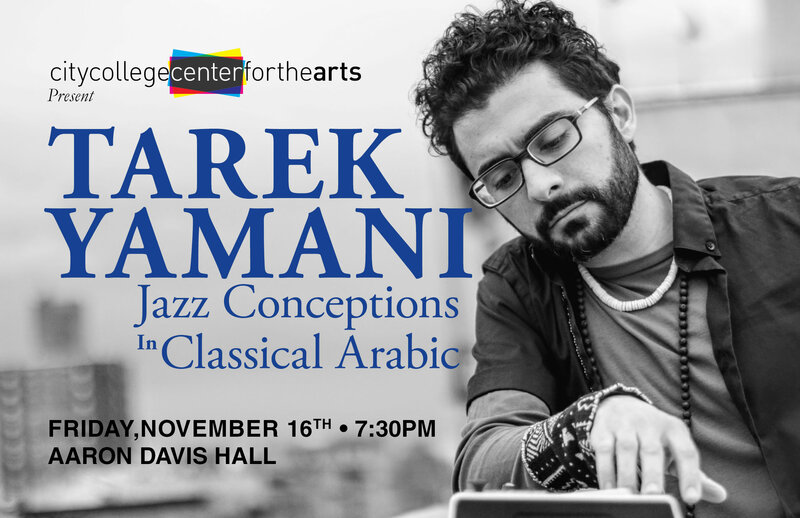 The hypnotic fusion of American jazz and Arabic tarab music arrives in Harlem as the Tarek Yamani Trio presents “Jazz Conceptions in Classical Arabic” on Friday, November 16, at Aaron Davis Hall. Presented by City College Center for the Arts (CCCA), the 7:30 p.m. concert will offer music lovers a wonderful mix of re-arranged late 19th century songs from the Arabic repertoire, jazz standards and original compositions based on Levantine rhythms by trio leader Tarek Yamani. A self-taught, award-winning jazz pianist, Yamani has earned praise from music critics around the globe. Rob Garratt of Time Out hailed his work as “shimmering spidery piano godliness”; and his recent albums, including 2014’s Lisan Al Tarab: Jazz Conceptions in Classical Arabic and his most recent work, Peninsular (2017), are critically acclaimed. Originally from Lebanon, Yamani now calls Harlem home and his unique style of music, “Afro-Tarab,” an enthralling harmony of American jazz and the classical Arabic music known as tarab, is a reflection of both his worlds. “Tarek Yamani is an amazing performer and his interpretation of American jazz through his own native culture is something that most people don’t get to hear often. The concert will be a truly superb event,” said Gregory Shanck, managing director of CCCA. A composer, educator and film scorer, Yamani has received many honors including winning the esteemed Thelonious Monk International Jazz Composers Competition and being named an artist-in-residence at the Baryshnikov Arts Center. As a performer he has shared the stage with such music greats as Wayne Shorter, Esperanza Spalding, Regina Carter and Zakir Hussain. The upcoming concert by the Tarek Yamani Trio will feature Yamani on piano, Sam Minaie on acoustic bass and John Davis on drums. Tickets are on sale now for $25 and can be purchased by visiting www.citycollegecenterforthearts.org or in person at the Aaron Davis Hall box office Tuesday through Friday from noon to 6 p.m. Aaron Davis Hall is located on the campus of the City College of New York at West 135th Street and Convent Avenue (129 Convent Avenue). For more details on this concert and other performances at Aaron Davis Hall, visit the CCCA website or call the box office at (212) 650-6900.